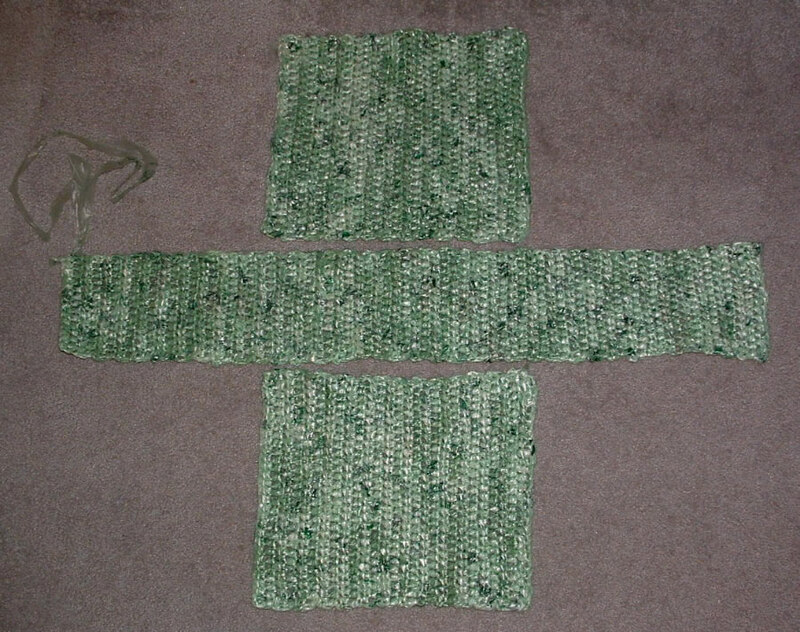 Repeat row 1 until you have 14 inches long which is about 28 rows. If your gauge is off a bit it doesn’t matter in this pattern. 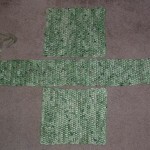 Repeat row 1 to create your strip by working even on 15 sts until your piece measures 40 inches long. Take the remaining main piece and place it together at the top of your long strip. Starting in the top edge corner of the bag, work a SC through both layers to attach in the same manner as you did above. Don’t finish off. Leave yarn attached to work handles. Using yarn still attached at top front edge of your bag, Sc in the next 8 sts, ch 27 for handle, skip over then to the remaining 8 sts of front side of the bag and work 8 Sc in ea st to match other side. Continue working Sc around in ea st until you are at the top front edge of the main piece of the other side, Sc in next 8 sts, ch 27 for handle, skip sts at center to the remaining 8 sts of front side of the bag and work 8 Sc to match other side. Do not connect or join at end of row, just continue working Sc’s in rounds until told to FO. Sc in ea st around to handle. Sc around chain of handle, (approx 27 Sc) evenly, then Sc in ea st around to other side’s handle. Sc around that handle chain to match other side. Sc in ea st to handle. Sc in ea st of handle and Sc in ea st of bag. Repeat for other side to match and Sl St into next two sts at side of bag to finish off edge smoothly. FO and weave in ends. COOL! I really like this pattern! I keep wanting to do the “plarn” thing, but I think you may have finally inspired me to try it! Happy New Year!!! BTW…about how long did this take you to crochet? This project took me a while to complete as I kept taking breaks from it. It does use a lot of bags and many hours from start to finish. But then it’s really cool so it’s worth it! Hi Cindy! Thanks for the visit and a happy, healthy and crafty New Year! Love the bag. I think I may try such a model in fabric strips some day. What a perfect thing! 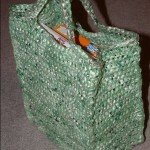 Something so right about making reusable grocery bags out of recycled plastic grocery bags. Good project! Well done Cindy. Happy New Year! Love your new bag! SewDelishâ€™s last blog post..Christmas Printable Freebies and Blog Anniversary! That’s just amazing. You should make a book and get it in the hands of all the WalMarts and grocery chains since they produce so many bags. They should buy millions and give it out to their customers. This is too cool and very innovative! I think it’s time I learn to crochet so I can make this. I love the size of this bag. And it’s constructed with a flat bottom — fantastic. Cindy, I have been using fabric grocery totes and made a small plarn tote a while back now for more than a year, maybe even just about two — now the big problem is getting the plastic bags to make into plarn — I am constantly begging and fanagaling for plastic bags to work with, but having now even made them for friends, the plastic bags are starting to become scarce amongst my circle of friends and family — Isn’t that GREAT! Hi , Thanx for visiting my site. And thanx for all the inspiration. 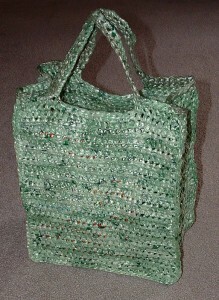 I love this green bag, and never thought of making them in pieces like this. Definetly worth trying. Love ALL your bags. I’ve been carrying PLARN grocery bags for a year now. All the checkers at the grocery stores are used to me by now and are no longer surprized by my bags. But every now and then a new person will show up and exclaim over them. My question is…where did you get GREEN bags? Around here (NC), colored bags are just not to be found. White everywhere except Dollar General (who I think just switched to white) ,Home Depot’s orangey tan and Lowes Grey. That’s it. I’d LOVE to find GREEN bags! list for bags so you might try that to get different colors. Thanks for stopping by my site and best wishes to you. Beautiful! I love the green! 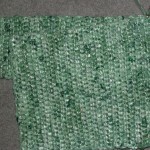 Knitting, crocheting and weaving with plarn has been such a joy … I love teaching folks how to do it – and how nice to have another online resource to which to point them! Cindy thtis is a great bag! I could never sew or create something like this, you are brilliant! I just found your site. WOW! what great directions for your bags. 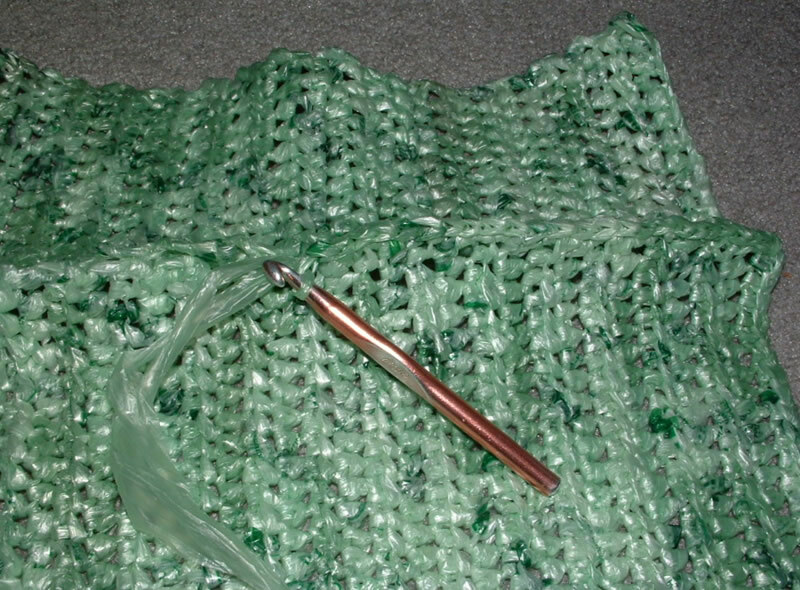 About a year ago I found another site with just a quick blurb and picture of a recycled-crocheted bag, but I could never find it again, and it had very little information. Long story short, I have been saving bags for all this time and happened upon your site! I started my bag last night, hubby laughed and laughed, he was starting to think I was hoarding grocery bags. He is so happy the “bag O’bags” in the garage will soon be dwindling down. I am so excited! All I have are white bags, maybe I need to go shopping at Dollar General to get some color … LOL!!! Thank you for your great site and wonderful directions. All my best! I love your site! This bag pattern is the best one I have seen, most I have come across do not have the flat bottom so they are more difficult to use for groceries! I have added your site to my blogroll, and I have blogged about your projects as well… You inspire me! 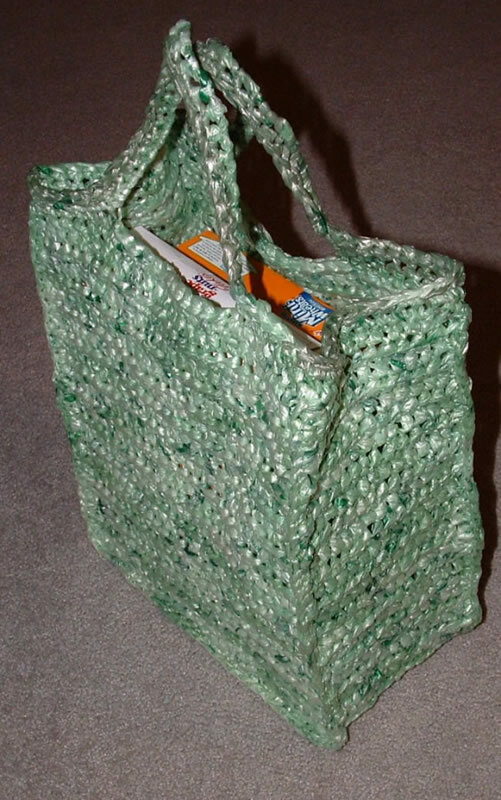 I love this idea, I had seen a couple of these crochet bags before in the grocery store but never knew how they were made before now. You can order a free promotional tote bag at my site http://www.myfreetotebag.com. I just started it, so once I get enough orders I will mail everyone a tote bag with a sponsor’s logo on it. It takes just a minute to order. No jokes, just free totes..
your patterns are so easy to follow. i taught myself how to crochet the night before i went on my senior class trip so i’d have something to do (i’m not a fan of amusement parks at all), and i recently saw a few bags made like this. i had trouble understanding some other patterns (too advanced, maybe?) but yours are much easier to follow and i’m going to start on one tomorrow when i wake up. thanks! I try and create my bags using basic stitches so everyone can understand and complete each project. It makes it so much more enjoyable when you can understand a pattern and just crochet rather than frogging something and not finishing the item. Thanks so much for stopping by and let me know if you have any questions while working this pattern. Best wishes on your future green crafting! Hi! how do I make plarn? 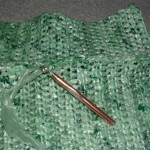 Here is the link for my picture tutorial on how to make plarn or plastic bag yarn. You can click on any of the pictures to supersize them. Best wishes and I hope you will try some of my projects. i love it…keep up the good work. Thank you! I came across a post somewhere about making plarn, and have since cut MANY shopping bags into pieces … I’ve got a ball about 8″ across so far, and a box of links waiting to become more plarn as we speak. My husband keeps telling me he’s interested to see how it turns out! 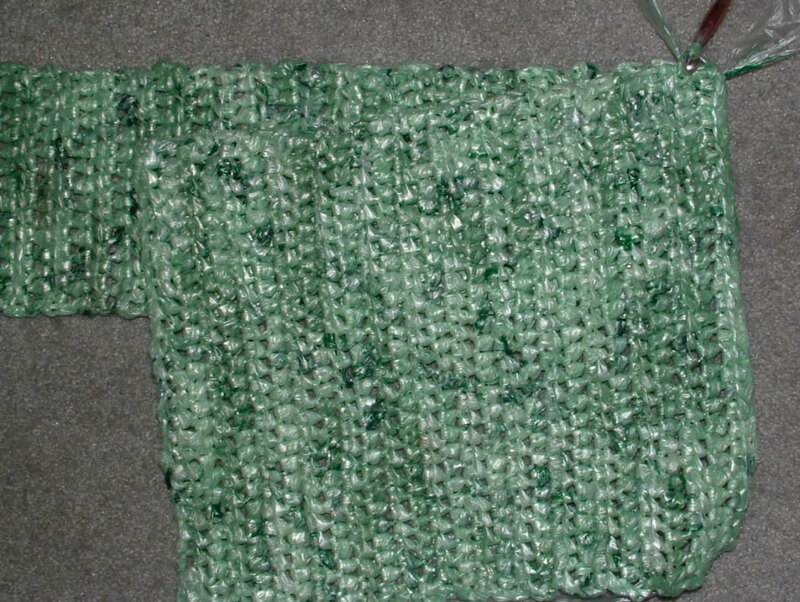 I think this is the pattern I will use – it looks pretty sturdy, which is really what I’m looking for. Here is an FYI – If anyone wants to know where to get the light green bags, go to the produce department, they have rolls of them to put produce in. Sometimes – I am able to get whole rolls of the bags. I also have orange ones that the meat department provides for customers to put meat in them to keep the containers from leaking on their hands.